I just can’t seem to avoid alliteration in my blog-post titles as of late! Truthfully, however, this title really seems to sum up just how badly I have been bitten by the “couture” bug. 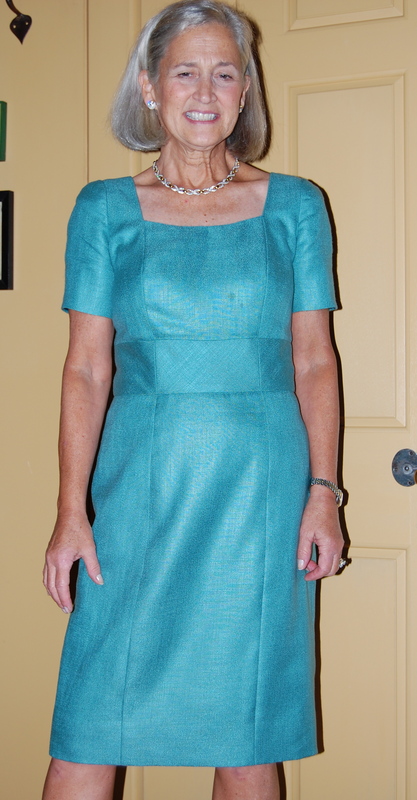 Earlier in the summer I signed up for Susan Khalje’s class, The Couture Dress, on Craftsy. I’ve mentioned it several times in my past posts, but now, my couture dress is finished. I decided to make this dress in the slim skirt with short sleeves. 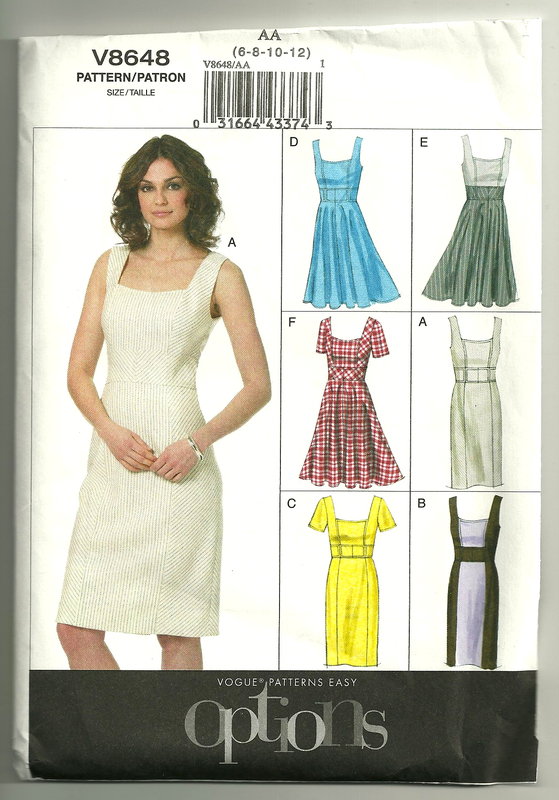 Although I could have substituted another pattern for my dress, I decided it would be beneficial to follow the exact steps which Susan takes one through in her course. (It helped that the view I chose to make reminds me very much of a classic 1960s–style dress). My idea of making a “muslin” or toile has been completely transformed by this course. I now know it as the most essential ingredient in the proper fit and alteration of a garment – and although the process of producing a useable muslin is time-consuming, every minute is worth it. There is nothing quite so discouraging as spending a lot of time, energy, and money on a garment and then not being completely satisfied with the fit. Making a couture muslin eliminates this possibility almost entirely. Check out the online preview of the course if you want to know more about this concept. Here is one of my muslin pieces. 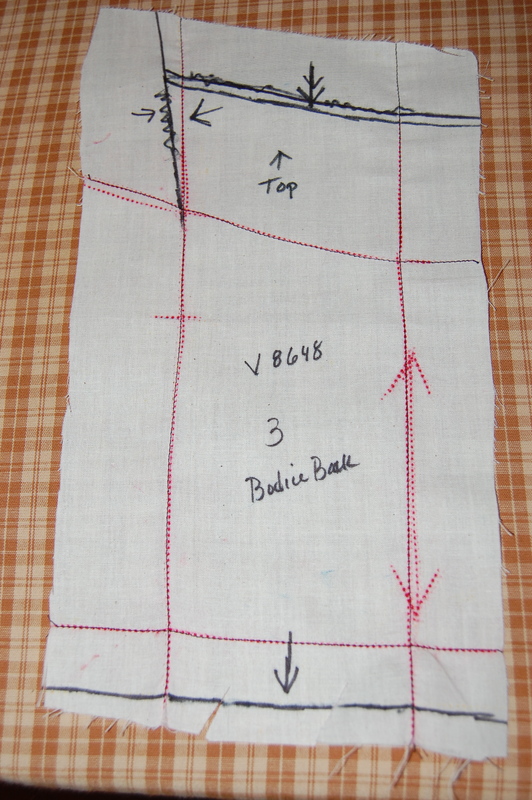 The lines in red were the original tracings from the pattern and the lines in black are my alterations. This muslin piece shows the “blind dart” I added to the neck edge. Susan goes over all these details in her course. There are several “hallmarks” of couture construction, I have learned: Control, Generosity, and that all-important duo of Form and Function. So what (in a nutshell) do these terms mean? 1) Control of the fit, which, as stated above, is the purpose of the muslin. 2) Control of the stitching line, which is your reference point for sewing – as opposed to the seam allowance, which is how most of us were taught to sew. Lots and lots of basting is the key to controlling the stitching line. 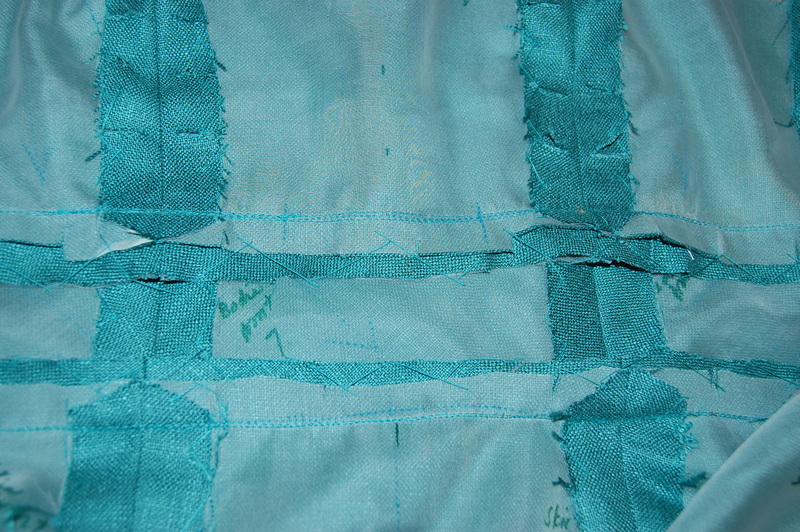 3) Control of the inner seams, the raw edges of which are each catch-stitched to the underlining. 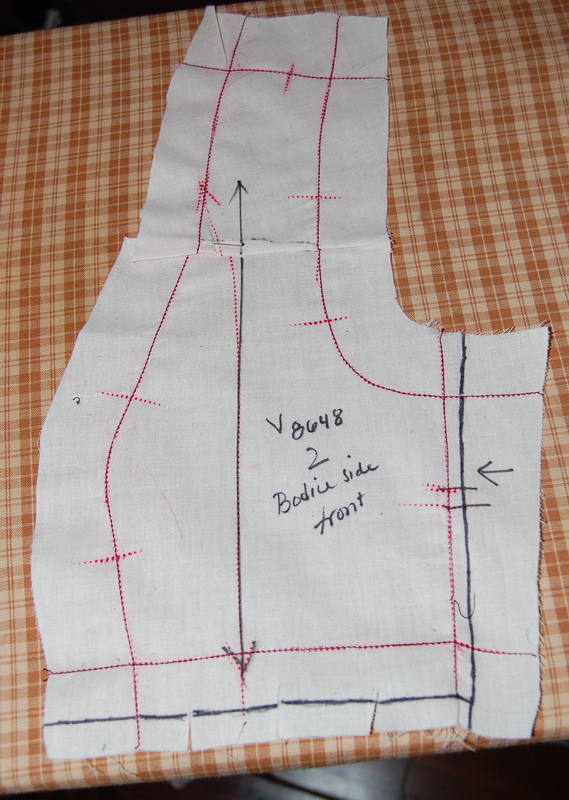 Here you can see the interior of the assembled dress, with every edge catch-stitched in place. The underlining serves as a “tablet” upon which you can make all kinds of notes! 1) Cutting out the muslin, the underlining and the fashion fabric with very large seam allowances which give you the flexibility you might need to make changes in your final fitting. 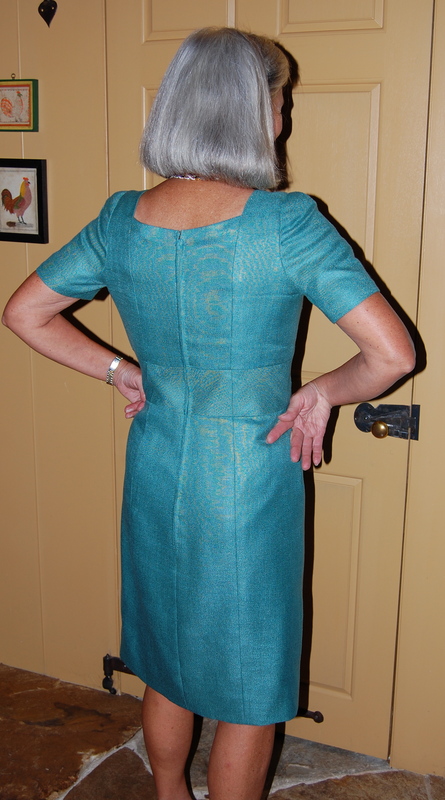 2) Allowing – and taking – the time to do a lot of hand-sewing, fitting, and detail work. If you look closely you can see the hand made loop and the “couture” attachment of the hook at the neck edge. I ended up applying a bias facing to the sleeve edges. At my final fitting, I decided I wanted the sleeves a bit longer than I had originally anticipated, so the bias facing gave me another 3/4 inch in length. This is one more detail which Susan covers in her fabulous course! 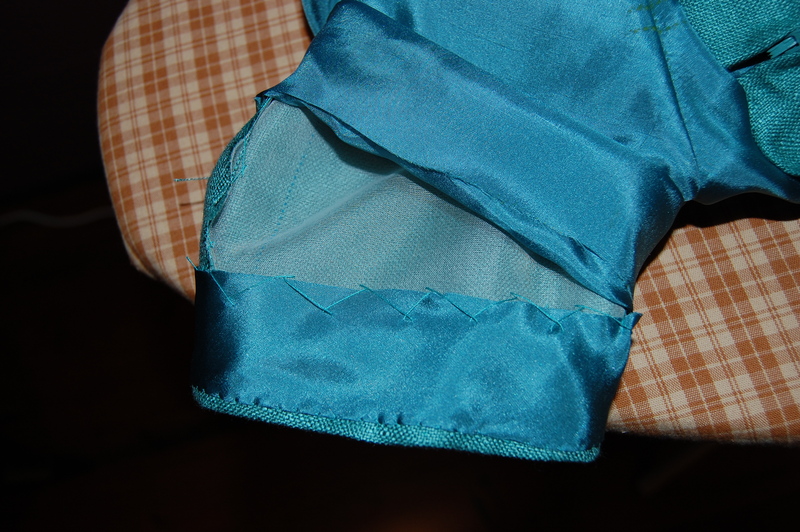 1) A couture lining is always applied by hand, using the fell stitch. To insure that the lining will not “migrate” to the outside, it is secured by the very lovely pick stitch – doing the job (function) in a truly elegant way (form). Here is the finished front neck edge, showing the “applied by hand” lining and the pick-stitches which keep the lining from migrating out of the dress! 2) The zipper (if you are using one) is a regular zipper (not invisible) which is set in by hand, again using the pick stitch. The top part of my hand-picked zipper. 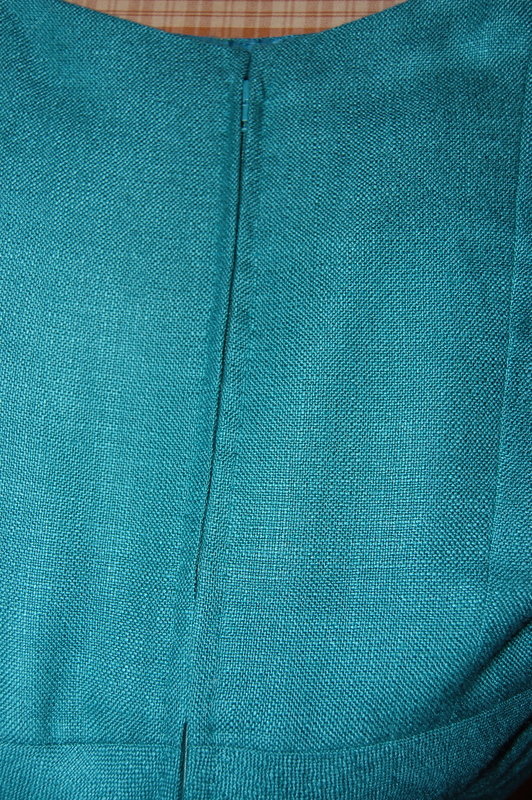 The fabric is a teal green linen; the lining is matching crepe de chine, and the underlining is white silk organza. … and a back view. 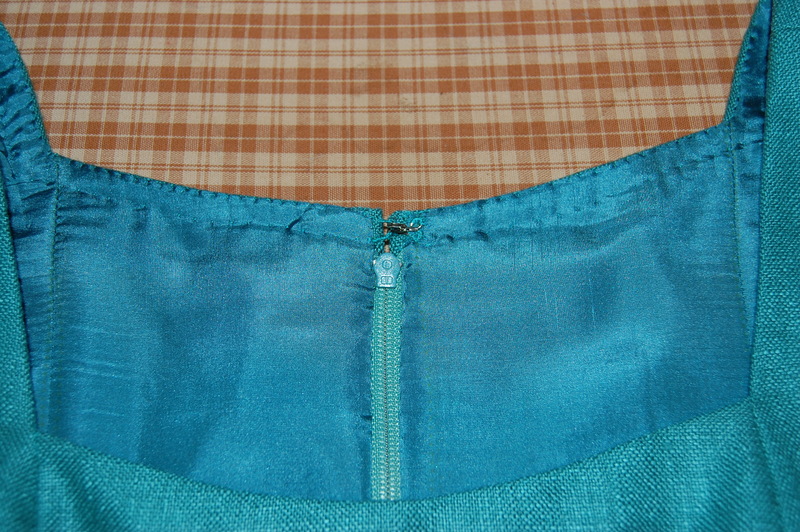 The instructions say to sew the zipper in by hand, the hooks and loops are shown in “couture” detail, and the hem treatment is very similar to one I learned in this course. One exception I should note here is that couture does not use facings as shown in the topmost drawing. Consider for a moment this advantage of using vintage patterns over contemporary ones: contemporary patterns, which are usually “multi-sized”, are drawn with the cutting line only. To make one of these patterns usable for couture construction, you must add the stitching line onto the pattern tissue, adding another step in the whole process. Vintage patterns (except for unprinted ones, of course) have the stitching line drawn on the tissue – ready to be traced onto your muslin fabric (which becomes your ultimate pattern). All of which brings me to another alliterative phrase . . . as I find myself Valuing all the many Virtues of Very Versatile Vintage! THUMBS UP!! Your dress is absolutely beautiful – perfectly tailored and perfect fit. It is an excellent dress to usher in the fall. Congratulations !! Thanks, Sarah – it was such a wonderful learning experience. Thanks again for encouraging me to take the class! Beautiful job on your dress – and beautiful color! 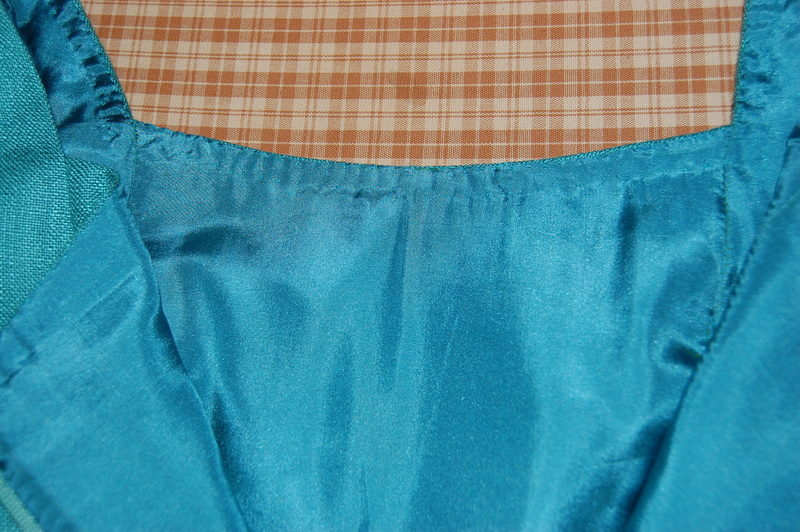 I learned the value of following the stitch-line of a pattern (and not a measured seam allowance) when the first theatre costume shop draper I worked with never measured seam allowances when she cut something out – you HAD to follow the stitch-lines or nothing would match up. And the fancy modern patterns (like Marfy brand) never include a seam allowance. 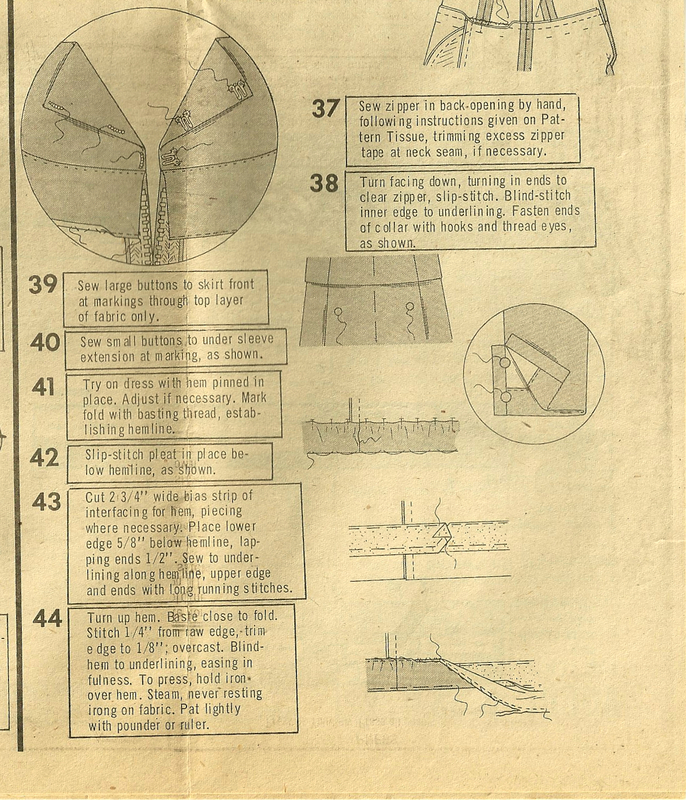 Interesting – I’ve never used a Marfy pattern. I’m not a big fan of these “multi-sized” patterns, as so often the variations between the sizes are so small, that’s it’s difficult to be precise when cutting and marking. Anyway, I’m now a total convert to following the stitching line and ignoring the seam allowance! Very nice fit and colour! I’m watching the course at the moment – love it! Just need to find time to start applying!! Once I had signed up for the course, it took me a few weeks to start my dress – it’s a little intimidating when you see how many lessons there are and how long some of them are! I watched some segments multiple times – and I really like the fact that I can refer back to it now whenever I want! It’s really an exceptional class! Best of luck! Beautiful dress! I, too, found this course absolutely invaluable and use the techniques in most of my sewing now! Great job. Thanks, Cissie! I think Susan is an exceptional teacher – and now I am determined to get to Baltimore for one of her jacket classes! She is even better in person! I never fail to learn lots and grow dramatically in her classes. Plus, nothing is more fun that spending all that uninterrupted time with fellow enthusiasts! Karen, Gorgeous dress on a lovely lady. Love the color and fit. Thanks so much for mentioning Susan Khalje’s etsy.com class. I am just about done viewing the lessons and ready to make the muslin. Did you then transfer the markings on the muslin to the underlining? Sorry, meant to say Susan Khalje’s class on craftsy.com. Wow this fits you amazingly! Well done!! Thanks so much! I had so much fun making this dress – it was a great learning experience and a real confidence-booster! Until you can get to Baltimore for Susan Khalje’s jacket class you might check out “A Classic French Jacket: 70 Hours to the Dream”, a guest column by Marina von Koenig posted about a year ago at burdastyle.com. Her photo and text of the class, “day-by-day report”, are at Frabjous-fashion.blogspot.com. Sounds like a dream vacation! Thanks so much for this link, Carol – I’ve bookmarked it so I can easily refer to it whenever I want! I will definitely be taking one of those classes next year.